This Monday, May 14, sees the start of Coeliac Awareness Week 2018. Coeliac disease affects an estimated 47,500 people in Ireland. The auto-immune disease prevents sufferers from digesting the protein gluten. This year, national charity The Coeliac Society of Ireland aims to raise awareness of the impact of the disease on families. If a first-degree relative of yours is coeliac, then there's a one in 10 chance you also have the disease. If undiagnosed, it can lead to serious health problems, and so the Society urges everyone who thinks they may be coeliac to go to their GP for testing. For those who have already been diagnosed, it means carefully following a diet void of wheat, barley and rye. However, that doesn't mean that you have to lose out on taste and variation, according to cook, food blogger and avid surfer Finn Ní Fhaoláin. Here Finn, who is herself coeliac, shares three of her favourite gluten-free recipes. "They're perfect for busy folk who want handy, gluten-free snacks for work, school or college or a quick, but delicious lunch," she says. "Remember to check that all packaged products are gluten free. Sometimes a naturally gluten-free product can become contaminated during production." 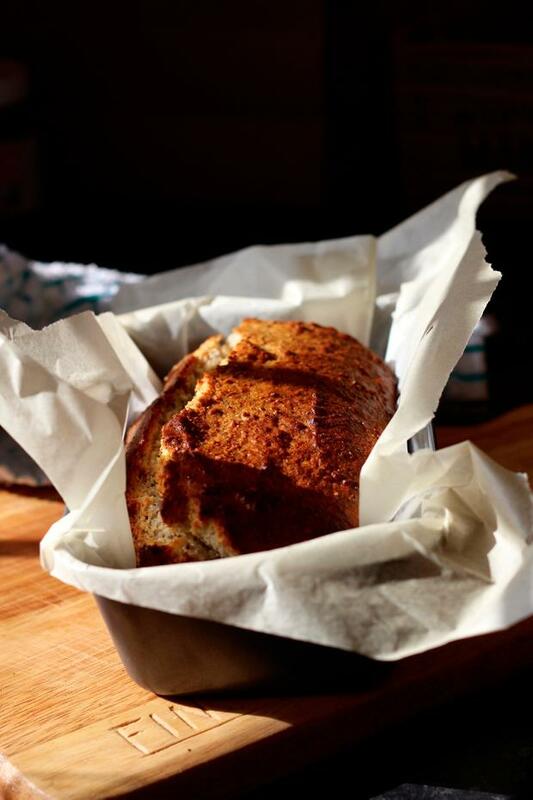 I was recently on a trip to Australia and everywhere I went, especially in Byron Bay, all I could see was banana bread! Since so much of it wasn't gluten free I wanted to put my own spin on it that was not only gluten free, but also vegan (also covering dairy- and egg-free folks as well). This is a great snack on the go or a sweet little breakfast, spread with some almond butter and washed down with an iced coffee. 1. Set the oven to 180˚C and line a loaf tin with baking paper. In a cup, add the chia seeds and water, stir and set aside - this will turn into a jelly-like consistency that will be our "egg". Magic! 2. In a mixing bowl, add the flour, ground almonds and baking powder and stir. 3. In another mixing bowl, add the bananas, oil, vanilla extract and maple syrup - if you like a chunkier consistency to your banana bread, mash the banana on a plate first using a fork before adding. If you're a little lazy like me, add it all together and blend with an immersion blender (the stick one you use for soup!). Add the chia seed mix and stir. 4. Add the dry bowl to the wet mix and stir in, then add your pecans or walnuts. I've suggested 1 cup here but if you like a crunchier texture, feel free to add more or even some dried fruit too if you like extra sweetness. 5. Pour the mix into the loaf tin and bake in the oven for 30 minutes. Some ovens may vary, this time is for a fan assisted oven, add a little more time for an oven without. 6. If its for an occasion, or you just wanted your food to look extra lovely, take the tin out after 15 minutes and sprinkle with desiccated coconut or very thin slices of banana and pop back in the oven for the remaining time. 7. This banana bread keeps well in an airtight container. It also freezes very well and can be pre-sliced and grabbed each day to pop in a lunchbox on the way out the door!